Recently while I was killing time with the twins while Pierce was at one of his little camps, I made a great find at a thrift store. It was one of those Trail-A-Bikes, which hook on to an adult's bike but allow the kid to ride around behind. They run about $250+ brand new, but this one that I bought used was only $20 (and it was in great condition)! 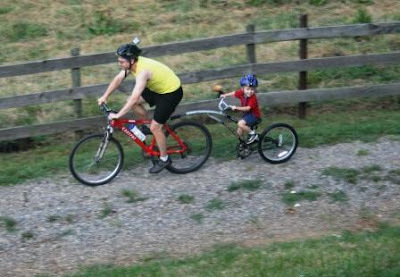 Kids can ride a Trail-A-Bike even when they aren't able to ride a regular bike without training wheels. 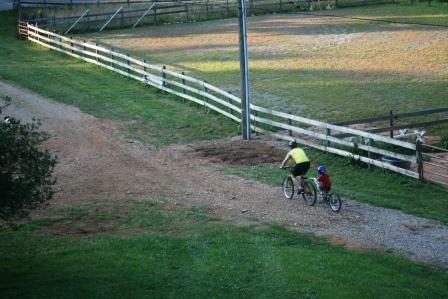 Pierce has absolutely fallen in love with riding the Trail A Bike with Paul. Every evening he begs to go for a bike ride. And the other weekend, they did an 11 mile bike ride! What an excellent activity for Pierce to do with his Dad! I think it may be the best $20 I have ever spent! Aren't they cute? You've gotta love a thrift shop! You just never know what you'll find, and you seem to have found quite a bargain. Love the photos! I'm seriously envious of your AWESOME find. I would love one of those but like you say, to buy regular price is a bit insane. Deaglan would love it too. how awesome is that?! and for $20!!! That's fantastic. Way to go, Mom! What a wonderful find! They do look cute! I bet there are two others dying to try it. That is an amazing find, not only for what you got for your twenty dollars, but for what it represents in the happy memories Pierce will have about time spent with his daddy! That-as they say, is priceless:) And 11 miles-wow! Way to go Pierce!! I have never seen such a thing, but what a smokin' bargain!When the twins get old enough for this it will wear Paul out riding with both of them every night. You better be on the lookout for a another one. That is so cool! We seen one of those the last time we were at Canaan. I had never seen one before then. That is really neat! Is it easy to drive? I'd be scared to do it myself but then again it has been years since I've rode a bike. I have never seen one of these! Would not have known what it was if I had seen it. How cool is that! What fun for both Dad and son. What a bargain you got! I have never seen one - and $20 - a real bargain. They look cute. Oh, this is way cool!! I have never seen anything like it! And they are adorable! Maybe the best shopping find ever? Hope you're havin a great weekend! Takes after his MUM too. Now THAT'S a lucky find! Awesome! I saw one of these in my neighborhood the other day. What a deal you got! And a great way to spend father/son time together. I know my kids would just love this. What a fabulous find and for only $20! You win the thrift store prize for the week, maybe the month. Love the photos and so glad your "boys" are having such a great time. That is SO cute! What a great find! I love thrifting.